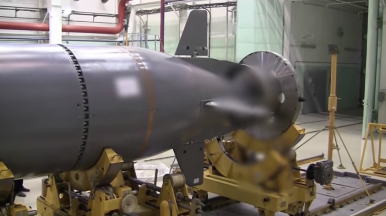 The Russian Ministry of Defense (MoD) has neither publicly commented nor confirmed the exact number of Poseidon UUVs to be inducted into service. Notably, while the source cites the total number of UUVs to be carried by each of the upgraded submarines at eight, past Russian sources noted that the Project 09852 boats will only be capable of carrying up to six UUVs, while Project 09851 submarines would accommodate up to four Poseidon UUVs. Given the purported size of the Poseidon UUV — twice the size of a submarine-launched ballistic missile — the latter number appears to be somewhat more realistic. Russia purportedly commenced sea trials of the Poseidon in December 2018. The ongoing tests are part of experimental design work rather than full-fledged sea trials, according to a Russian defense industry source. As I reportedly previously, Russia’s MoD already announced in July that sea trials, primarily focused on the UUV’s guidance system and underwater operations in autonomous mode, were under way. The underwater tests are likely carried out by a B-90 Sarov-class Project 20120 diesel-electric submarine, which serves as the launch platform for the UUV.